New analysis of artefacts found at a South China archaeological site shows that sophisticated tool technology emerged in East Asia earlier than previously thought. 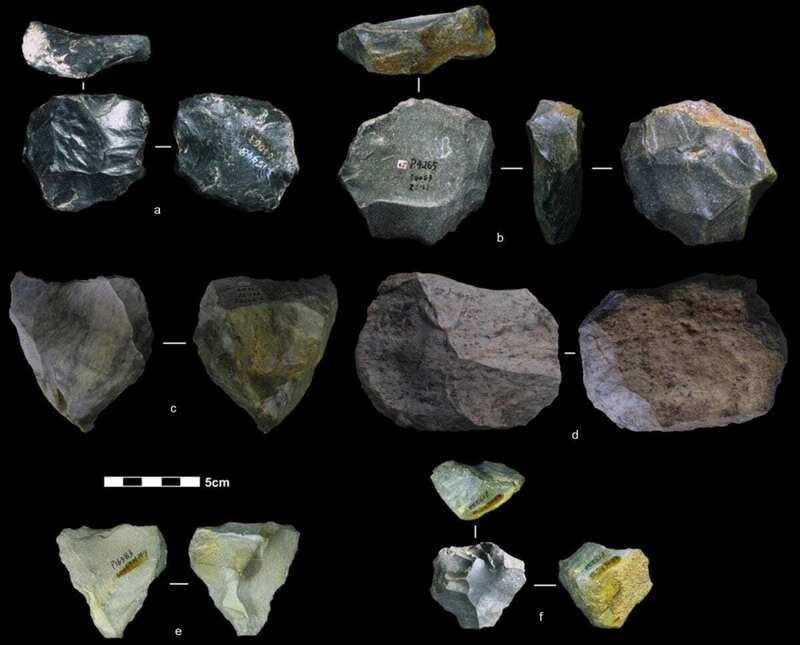 A study by an international team of researchers, including from the University of Washington, determines that carved stone tools, also known as Levallois cores, were used in Asia 80,000 to 170,000 years ago. Developed in Africa and Western Europe as far back as 300,000 years ago, the cores are a sign of more-advanced toolmaking — the “multi-tool” of the prehistoric world — but, until now, were not believed to have emerged in East Asia until 30,000 to 40,000 years ago. With the find — and absent human fossils linking the tools to migrating populations — researchers believe people in Asia developed the technology independently, evidence of similar sets of skills evolving throughout different parts of the ancient world. Levallois-shaped cores — the “Swiss Army knife of prehistoric tools,” Marwick said — were efficient and durable, indispensable to a hunter-gatherer society in which a broken spear point could mean certain death at the claws or jaws of a predator. The cores were named for the Levallois-Perret suburb of Paris, where stone flakes were found in the 1800s. The Levallois artefacts examined in this study were excavated from Guanyindong Cave in Guizhou Province in the 1960s and 1970s. Previous research using uranium-series dating estimated a wide age range of the archaeological site — between 50,000 and 240,000 years old — but that earlier technique focused on fossils found away from the stone artefacts, Marwick said. Analyzing the sediments surrounding the artefacts provides more specific clues as to when the artefacts would have been in use. Marwick and other members of the team, from universities in China and Australia, used optically stimulated luminescence (OSL) to date the artefacts. OSL can establish age by determining when a sediment sample, down to a grain of sand, was last exposed to sunlight — and thus, how long an artefact may have been buried in layers of sediment. The researchers analyzed more than 2,200 artefacts found at Guanyindong Cave, narrowing down the number of Levallois-style stone cores and flakes to 45. Among those believed to be in the older age range, about 130,000 to 180,000 years old, the team also was able to identify the environment in which the tools were used: an open woodland on a rocky landscape, in “a reduced rainforest area compared to today,” the authors note. In Africa and Europe these kinds of stone tools are often found at archaeological sites starting from 300,000 and 200,000 years ago. They are known as Mode III technology, part of a broad evolutionary sequence that was preceded by hand-axe technology (Mode II) and followed by blade tool technology (Mode IV). Archaeologists thought that Mode IV technologies arrived in China by migration from the West, but these new finds suggest they could have been locally invented. At the time people were making tools in Guanyindong Cave, the Denisovans — ancestors to Homo sapiens and relative contemporaries to Neandertals elsewhere in the world — roamed East Asia. But while hundreds of fossils of archaic humans and related artefacts, dating as far back as more than 3 million years ago, have been found in Africa and Europe, the archaeological record in East Asia is sparser. Header Image – These artefacts found in China are among the nearly four dozen that reflect the Levallois technique of toolmaking. In a paper published Nov. 19 in Nature, researchers date these artefacts to between 80,000 and 170,000 years ago. Credit : Marwick et al.